Dashboard allows you to apply filtering to each individual data-aware dashboard item. This topic describes how to enable and reset filtering. To configure filtering in the Designer, select the target dashboard item and do one of the following. Click the Edit Filter button in the Data tab. Right-click on a dashboard item and select Edit Filter from its context menu. This will invoke the Filter Editor dialog. Use this dialog to build filter criteria with a convenient tree-like interface. 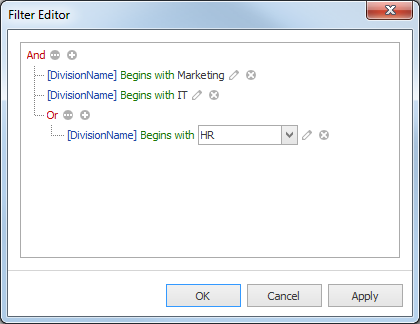 You can use hidden dimensions within the Filter Editor dialog, allowing you to filter data based on their values. For more information see Hidden data items. To learn how to work with the Filter Editor, see Search and find projects, in the Use filters section. To clear filtering in the Designer, select the target dashboard item and do one of the following. Click the Clear button in the Data tab. Right-click on a dashboard item and select Clear from its context menu. You cannot apply filtering by building complex filter criteria in OLAP mode. Instead, you can filter dimension attributes and hierarchies by manually selecting the values you wish (or do not wish) to include in the dashboard. For dimension attributes, the Filter Editor contains a list of all values. You can select the values that you wish to display. For hierarchies, a tree is displayed instead, allowing you to filter individual values at any hierarchy level. Filtering - InLoox • Copyright 1999-2019 © InLoox, Inc. All rights reserved.